It wouldn’t be the InfoComm show if the InfoComm/Rental & Staging Systems New Product Awards were not being announced and presented to winners. But you have to enter first. 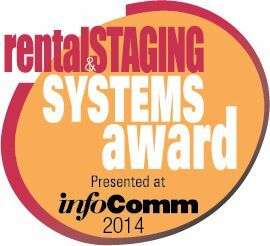 The 2014 Rental & Staging Systems/InfoComm New Product Awards are open for online entry. The Awards recognize the best new products introduced from June 2013 to March 2014, for either the staging market, or the AV rental market. Winners will be announced at InfoComm 2014 in Las Vegas in June.